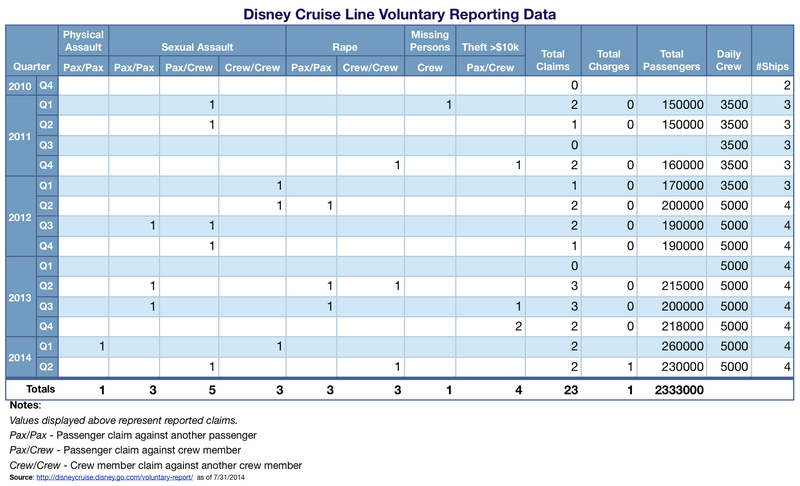 This week, Disney Cruise Line published their Q2 – 2014 Voluntary Crime Allegation disclosure report for the period April 1 – June 30, 2014. During this period there were two allegations disclosed. The first involved an incident involving a stateroom host and passenger where charges were filed. The second allegation was made by a crew member against another crew member. During the quarter DCL estimated there were 230,000 passengers and a daily complement of 5000 crew members. According to the report, these allegations were reported to the appropriate law enforcement and government authorities. There was an decrease of 30,000 passengers during the second quarter of 2014 compared to apparent quarterly record set in Q1-2014. According to the voluntary reports published to date, to the best of Disney Cruise Line’s knowledge, no other charges have been filed in any of these alleged incidents outside of the charges referenced in the Q2-2014 report. Please note, reports for previous quarters with zero claims did not include total passenger or crew numbers. However, the daily crew numbers seem fixed on these reports so I’ve carried that number over for the months without any claims.